A gripping debut novel about a very bright young woman who follows her dream for an education, but faces challenges when she marries her professor. His career path takes them to Los Alamos and spans the years before WWII to the present day. The reader is caught up in the life of Meridian Wallace as she goes to graduate school but creates her own study of birds and continues to dream of becoming an ornithologist. This will be a sure fire hit with book clubs. In her sweeping debut novel, Elizabeth J. Church takes us from the World War II years in Chicago to the vast sun-parched canyons of New Mexico in the 1970s as we follow the journey of a driven, spirited young woman, Meridian Wallace, whose scientific ambitions are subverted by the expectations of her era. In 1941, at seventeen years old, Meridian begins her ornithology studies at the University of Chicago. She is soon drawn to Alden Whetstone, a brilliant, complicated physics professor who opens her eyes to the fundamentals and poetry of his field, the beauty of motion, space and time, the delicate balance of force and energy that allows a bird to fly. Entranced and in love, Meridian defers her own career path and follows Alden west to Los Alamos, where he is engaged in a secret government project (later known to be the atomic bomb). In married life, though, she feels lost and left behind. She channels her academic ambitions into studying a particular family of crows, whose free life and companionship are the very things that seem beyond her reach. There in her canyons, years later at the dawn of the 1970s, with counterculture youth filling the streets and protests against the war rupturing college campuses across the country, Meridian meets Clay, a young geologist and veteran of the Vietnam War, and together they seek ways to mend what the world has broken. 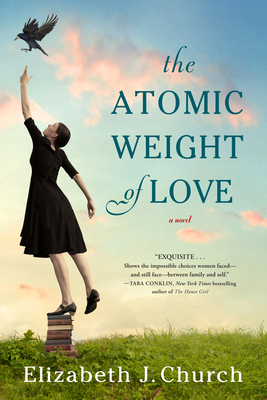 Exquisitely capturing the claustrophobic eras of 1940s and 1950s America, The Atomic Weight of Love also examines the changing roles of women during the decades that followed. And in Meridian Wallace we find an unforgettable heroine whose metamorphosis shows how the women’s movement opened up the world for a whole generation. Elizabeth J. Church was born in Los Alamos, New Mexico. Her father, a research chemist, was drafted out of Carnegie Mellon University, where he was pursuing his graduate studies, and was sent to join other scientists working in secret on the Manhattan Project. Church’s mother, a biologist, eventually joined her husband in Los Alamos. While The Atomic Weight of Love is not their story, it is the story of many of the women who sacrificed their careers so that their husbands could pursue unique opportunities in scientific research. Along with other Los Alamos children, Church grew up in an environment that gave her ready access both to nature and to female teachers who had advanced degrees in mathematics, chemistry, physics, biology, and other disciplines. Church practiced law for over thirty years, focusing on mental health and constitutional law issues. After circumstances taught her the brevity of life, she walked away from the law to pursue her original dream of writing. She has written extensively for legal publications and scientific journals. Her short story "Skin Deep" won first prize in Literal Latté’s 2001 fiction contest, and "Lying with Dogs" was published in Natural Bridge in 2002. This is her first novel.